I have been looking forward to this since early January! As part of the new year, I set goals for my blog: things I wanted to accomplish and numbers I wanted to work towards. One of those goals was reaching 10K Facebook fans. I am so excited to have reach that goal less than two weeks ago, much faster than I expected! Turns out my friend Lindsay from Life, Love and Sugar also reach 10K fans last week. I meet Lindsay in Utah in February and she has quickly become a good friend of mine. We bonded over a love of sugar and blogging. Lindsay and I have teamed up to giveaway a goodie basket of our favorite baking items. We want to thank YOU for your support. Of coarse, you can skip the recipe and go straight to the giveaway, but I highly recommend you check out these cookies! Keep your eyes peeled for our upcoming COOKIE DOUGH WEEK. It starts on Monday and let’s face it, I am super excited. These Cadbury Ganache Cookie Cups could not be easier! All you need is a package of Pillsbury cookie dough, some Cadbury Crème Eggs and some heavy whipping cream. The heavy whipping cream helps to smooth out the Crème eggs once melted. It creates an irrespirable, silky ganache that fills the center of the cookie. Last year, I made Cadbury Cookie Brittle, and although I thought at the time it was somewhat genius, it didn’t quite execute how I wanted to and let’s face it, the photos are horrible. So I wanted to update the recipe and make it a little bit more appealing to the eye. 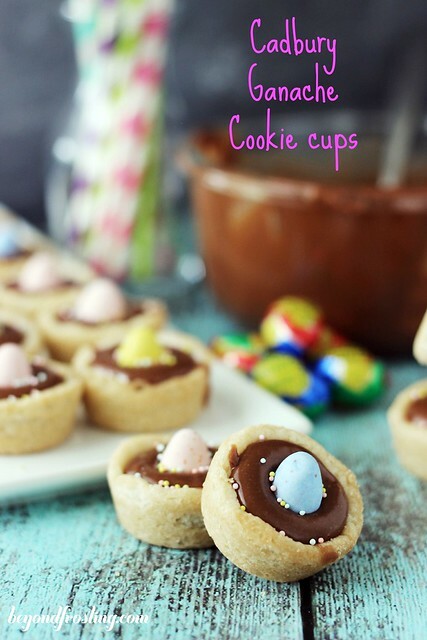 Everyone loves cookie cups right? They are easier to make because you don’t have to worry about the dough spreading and ending up with a flat cookie. You can fill them with just about anything from candy to frosting or ganache. I hope you enjoy! Don’t forget to scroll down and enter the giveaway! Don’t forget to save your favorite recipes to your recipe box with the button. You can create a meal plan and a shopping list all in the same place! 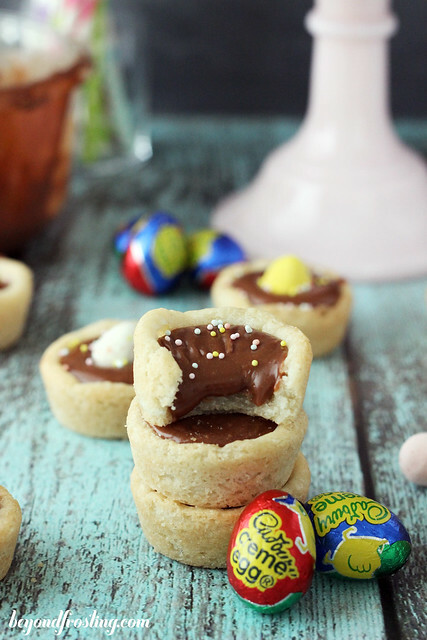 A sugar cookie filled with melted Cadbury Creme Eggs. Grease a 24 mini muffin pan with non-stick baking spray or Crisco. Take about 1-2 tablespoons of dough and roll together between your hands to form a ball. Drop into the mini muffin pan. Bake cookies for 10-12 minutes or until golden brown. Remove cookies from oven and gently press down in the middle with a tart shaper or the back of a spoon. Allow to cool for at least 10-15 minutes. Gently remove cookie cups from the muffin pan and place on a cooling rack until completely cooled. It may help to run a knife around the edge of the cookie to remove it. 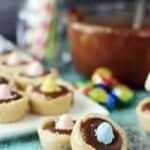 To prepare the ganache, remove the wrappers from the Cadbury Eggs. In a large microwave-proof bowl, cut the eggs in half. Add 4 tbsp heavy whipping cream. Microwave on high for 30 second intervals. Stirring after each 30 seconds. Continue until melted. Stir vigorously until well mixed. It will be difficult to get this completely smooth. Add additional heavy whipping cream to make the ganache thinner. 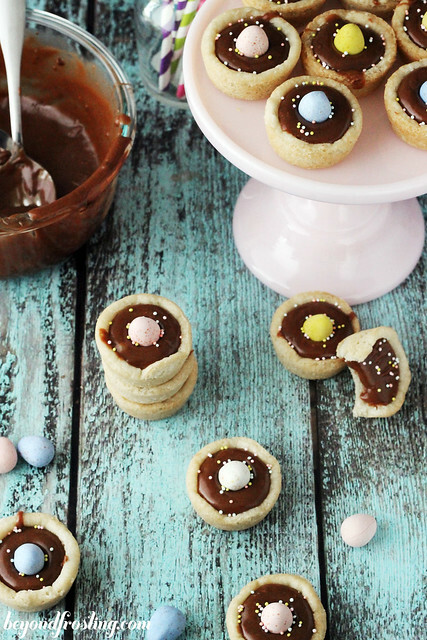 Once cookie cups are cooled, spoon ganache into the hole you made in the cookie cup. Garnish with sprinkles. 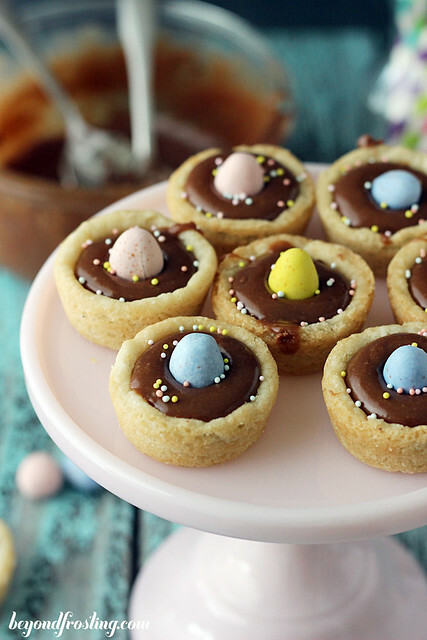 Immediately press a Cadbury Chocolate Mini Eggs into the ganache. Allow to set for at least 15 minutes. This giveaway is open to US Residents only, ages 18 and above. Please see additional terms and conditions at the bottom of the Rafflecopter. Giveaway closes at 11:59PM EST on March 25th. Hi Tamara, I am sorry to hear you had an unpleasant experience. Did you buy the large sugar cookie dough (16.5oz)? The Cadbury Ganache is difficult to get completely smooth, but when you spoon it into the cookie cups, it actually creates a nice glaze. I am not sure what you mean about cooling in the pan and removing it with a spoon? Do you mean the cookie cups? I suggest to run a knife around the edges to help loosen the cookies. Just found you on Pinterest. Will definitely be following you! I love baking period. No, make that an exclamation!!!! These look so yummy! Pinned this!